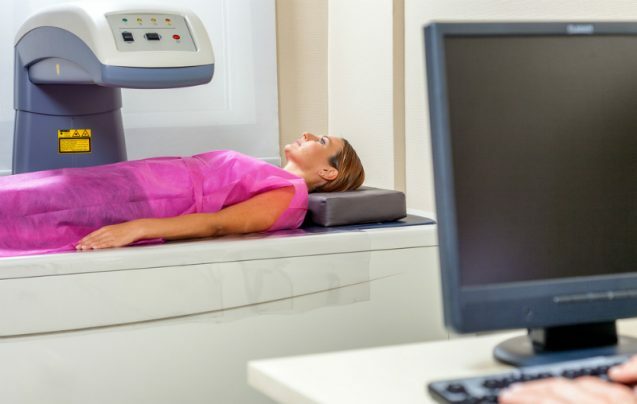 Home » Blog » Why Do I Need A DEXA Scan? DEXA – also called dual-energy x-ray absorptiometry, bone densitometry or more commonly, bone density scanning. This enhanced X-ray technology is the diagnostic tool of choice to measure bone mineral density (BMD). Also used for other body composition measurements including body fat. BMD – bone mineral density. A BMD test can detect osteopenia and osteoporosis by measuring the density (strength) of your bones in the hip and spine as represented by calcium content. QCT – An alternative to DEXA, Quantitative Computed Tomography is performed on a CT scanner and also measures BMD. QCT is generally used when DEXA is not available (e.g. in rural areas). However, research shows that a QCT scan can detect low bone mass earlier than other scans as it isolates the soft bone in the spine for analysis (soft bone is affected earlier than hard bone) (source). A Dexa Scan is quick, painless and safe. It takes approximately 15- 20 minutes for the scanner to pass over specific areas of your body while you lie on your back. Results are interpreted by an imaging specialist and passed on to your GP. Please discuss getting your results with your clinician on the day of your scan. You can eat and drink on the day of your test, but make sure you read preparing for your DEXA test. Should I Have A DEXA Scan? If your doctor recommends a DEXA scan, it is a good idea to follow their advice. Knowing what is going on inside your body will help you make lifestyle changes to improve health and prevent disease. You have recently fractured a bone in circumstances that wouldn’t normally cause a fracture. DEXA scans are also the most accurate way to measure your body fat percentage and pinpoint its location, specifically, fat located in the abdominal cavity. Fat stored around the internal organs, known as visceral fat, is dangerous and puts you at a higher risk of a range of conditions including heart disease, diabetes and some cancers. The body composition data provided from a DEXA scan can be interpreted to help you make changes to your diet and exercise regime. A follow-up DEXA scan will help you see the positive effects of these changes.